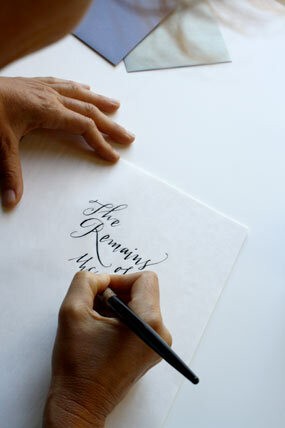 For as long as I can remember, I have been fascinated by handwriting. The lively and uniquely expressive quality of words written by hand captivated me at an early age. As a result, much of my childhood was spent writing on any available surface, much to the chagrin of my mother. It wasn’t until I was in college, while studying graphic design and typography, that I discovered the formal art of calligraphy. For me, calligraphy communicates ideas by connecting art and imagination to words. Throughout the world and over centuries, scribes have employed pen, brush, ink and paper to convey meaning to the written word through dynamic styles and forms. Such a rich tradition provides the modern calligrapher with an enormous range of writing styles that can be interpreted to reflect a specific mood or feeling. Letters provide an endless possibility of shapes, lines, and marks to explore and improvise a larger design concept. Calligraphy is a surprisingly open medium, allowing for the creation of completely legible forms and the development of more abstract concepts. As our society becomes entrenched in a digitally-driven world, there is a need for more personal modes of communication. Handwriting allows a reader to experience the presence of an individual and the ways his or her personality is reflected in it. As such, calligraphy offers a more personalized form of communication; it engages the psychological sensibilities we associate with the intimacy of handwriting. By creating a visual interpretation of language, I use calligraphy to capture what one can often express verbally, but may be less able to articulate in typographic form. A word written in calligraphy can convey whimsicality, playfulness, elegance, simplicity, boldness, sharpness, or seriousness by the way it has been rendered on the page. Calligraphy offers the ability to add depth and nuance to whatever idea a person wishes to communicate and can be both evocative and beautiful. Each time I am presented with a new project, I enjoy the challenge of taking all the elements of the intended concept or ideas, and creating a visual language to express them. Because calligraphy often works in concert with various other design elements such as typography or an illustration to create a larger visual experience, I incorporate these in my process. I often begin with a series of sketches that explore different visual interpretations of a specific word or phrase. Once one of the sketches is selected, I work in collaboration with the client to refine it and bring it to its final artistic form. Over the past 15 years, I have completed a variety of projects. These have included: logos, wine labels, book titles, signage, one-of-a-kind commissions, menus, invitations, etc. I have worked with a range of clients including graphic designers, letterpress printers, private companies, and individuals. Among former and current clients are: Robert Mondavi Winery, Columbia Winery, Klutz Press, University of California Berkeley, Marcel Schurman Stationary, Potlatch Paper Company, Sax Fifth Avenue, San Francisco Symphony, and Martha Stewart Magazine. I look forward to the opportunity of working with you and making the expressive art of calligraphy part of your future projects.